History and nature come alive at the Lightner Farmhouse Bed and Breakfast. 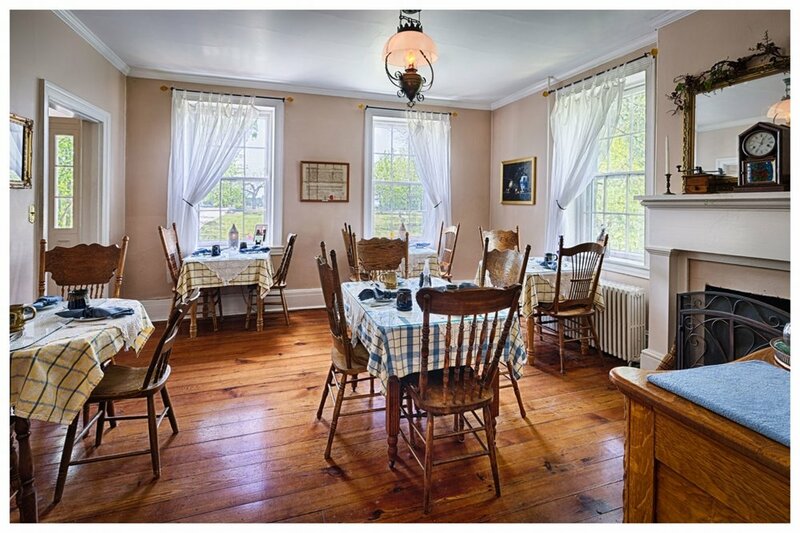 We have carefully preserved the original character of Isaac Lightner’s 1862 home, including the wide moldings, random-plank floors, and four fireplaces while adding modern conveniences such as central air conditioning, private en suite bathrooms and a TV in each room. One night reservations are always welcome Sunday through Thursday night. From April through October we prefer a two night reservation on weekends unless a one night opening is available. Phone us please with those requests.Due to the historic nature of our home, we have no ADA compliant rooms and apologize for any inconvenience. Our rooms are decorated in themes inspired by quilt designs, and each is named after one of Pennsylvania’s native trees. For your comfort, all our rooms have queen or king-size beds and a private en suite bathroom with either a tub or tub/shower combo. The rooms also offer amenities such as personal hair dryers and small water coolers. Please click on the room photos for more information on that particular room. Nightly rates are listed also. Just click! 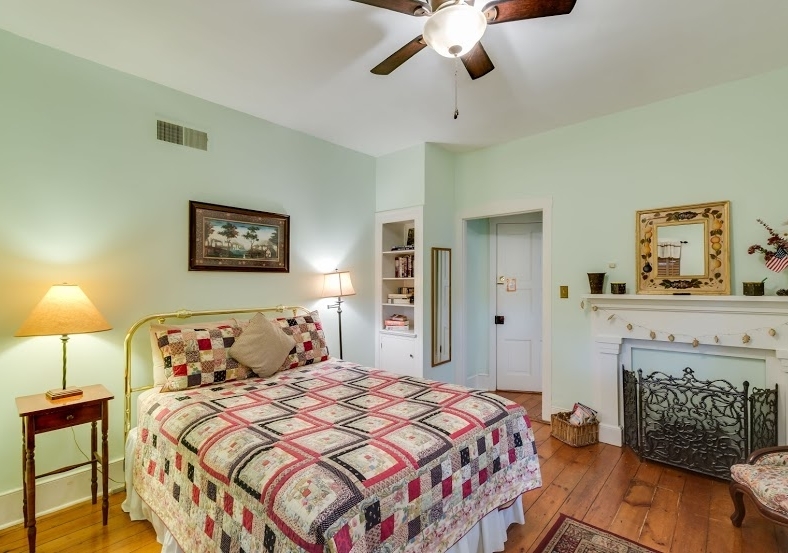 The Cedar room is a first floor bedroom with a queen size bed, private bath and a private entrance from the side porch of the Inn. Working fireplace in this room!! Flat screen TV and central air conditioning. History buffs love the Birch Room which reflects an Americana theme of red, white and blue, and overlooks the front and side yards. Private bath, Flat screen TV in room. Air conditioned and ceiling fan for comfort. $145 a night on weekdays, $155 on weekends. Maximum 2 persons. Get cozy in the Oak Room which features a brass bed. This is our only standard size room with a shower and bathtub combination. Working fireplace in the room. Flat screen TV. Central air conditioning and a ceiling fan. The Chestnut Room will put you in a romantic mood with its soft colors and brass bed. Private bath, flat screen TV, central air and a ceiling fan. Our lovely two-room Pine Tree Suite is located on the third floor of the Farmhouse. Dark hardwood floors and exposed ceiling beams give this suite a rustic feel. Barn red fabrics combine with denim to accent the queen-size bed of iron and wood. A daybed with trundle can accommodate two additional guests in the second room of the Pine Tree Suite. TV in the sitting room. A private bath room is included in the suite. $175 for 2 persons on weeknights; $185 on weekends. Sleeps up to 4 people. 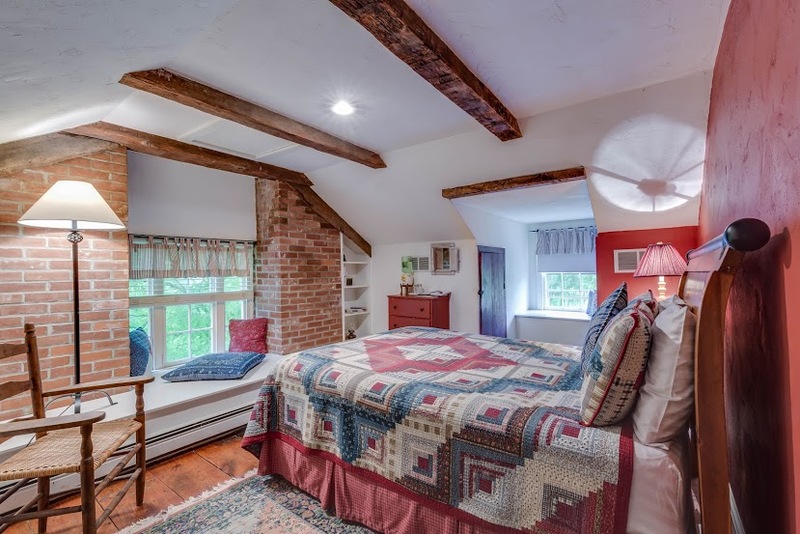 Located on the site of the original summer kitchen, our air conditioned two-floor Walnut Cottage is perfect for romantic get-aways to celebrate anniversaries, honeymoons or other special occasions. 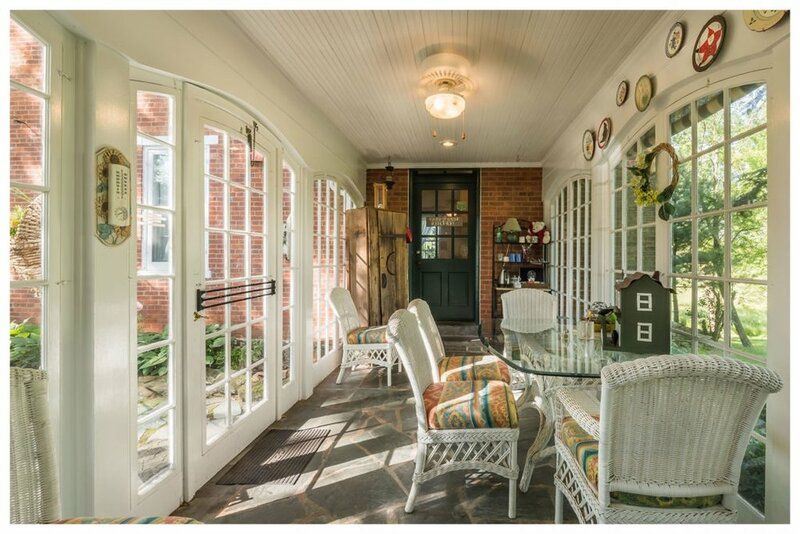 Guests of this suite are served a private breakfast in the breezeway in season upon request, and they may relax on a private wrap-around porch with rocking chairs and a view of the Nature Trail. $199 per night for first 2 persons on weeknights; $209 on weekends with additional charges for extra persons. Sleeps up to 5 persons. $25 per extra adult, $10 per child (maximum 2). Valentine's is for lovers! Let us pamper you. 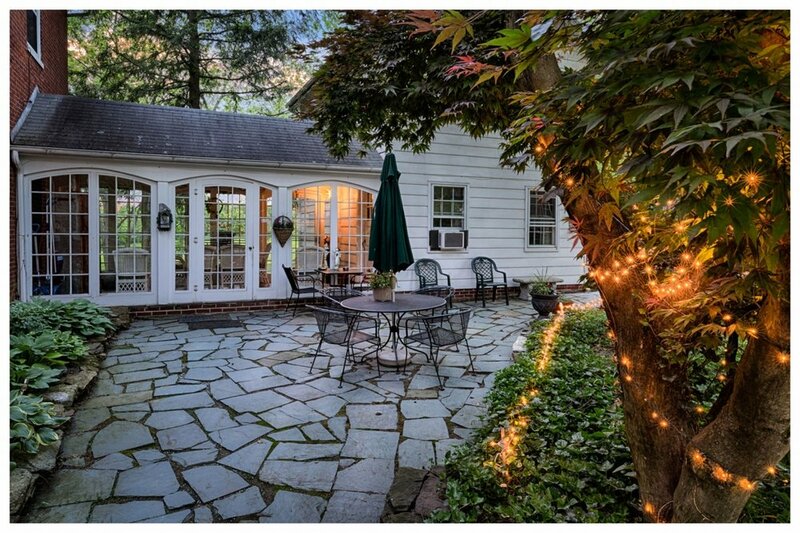 Porch sitting time is here! It’s that time again when the porches at the Lightner Farmhouse are an attraction for our guests and for our cat, Jezzie. If you are a cat lover as Debbie is, just sit on a rocking chair and Jezzie will be more than happy to spend time with you. Every morning he checks out both the side porch (Isaac Lightner’s veranda) and the porch of the Walnut Cottage in hopes someone is available for lap sitting. Of course there are many more reasons to visit us including the cozy, comfortable rooms and the delicious breakfasts prepared daily by Jason. If you have special dietary needs, let us know and we will accommodate the breakfast menu to meet your needs. Hope to see you soon! Gettysburg is a central location for exploring south central Pennsylvania, Maryland and northern Virginia. Stay with us a week and you will tour the Gettysburg attractions plus have time to do several day trips to Harrisburg, Hershey, Lancaster, Antietam, Harpers Ferry and Washington DC. To help you with your plans, visit www.destinationgettysburg.com for the “Calendar of Events” in order to add special events that be be taking place in Gettysburg during your visit. And remember to ask Eileen for further suggestions as you plan your trip. We suggest a minimum of two full days and ideally a three day visit to Gettysburg. See our suggested itinerary below but feel free to explore all the options and create your own as well. Tour the National Military Park Visitor’s Center Museum just two miles from our B&B in the morning followed by a private tour of the battlefield in the afternoon with a Licensed Battlefield Guide. Enjoy dinner at the Dobbin House and take a Ghost Storytelling walk in town. Tour the Eisenhower Farm in the morning followed by lunch at a downtown Gettysburg restaurant and a tour of either the Shriver House, the Wills House or the Jenny Wade House. Spend some time in the boutique shops along Chambersburg, York and Baltimore Streets and possibly enjoy wine tasting at the downtown winery shops. Finish your day with a Paranormal Investigation with Stewart Cornelius of History and Haunts. Choose from either a tour of the many area antique malls, a visit to the three area wineries or an agri-tourism visit to the orchards and farm stands of the area. Nearby New Oxford is home to over 200 antique shops and close to the Hauser Estate Winery which has local PA wines. The Round Barn is one of the outlets for local produce. In addition to these ideas, the third day could take advantage of either a horseback or a segway battlefield tour. Discover Gettysburg, and Lightner Farmhouse.